Penguins On My Shirt: Happy Birthday To You. Happy Birthday Dear Mike. Jan. 23 was/would have been Mike's 38th birthday. It was a weird day for me and I was a bit moody. The roads were still in poor condition from the snow and so we weren't able to make it to the cemetery. 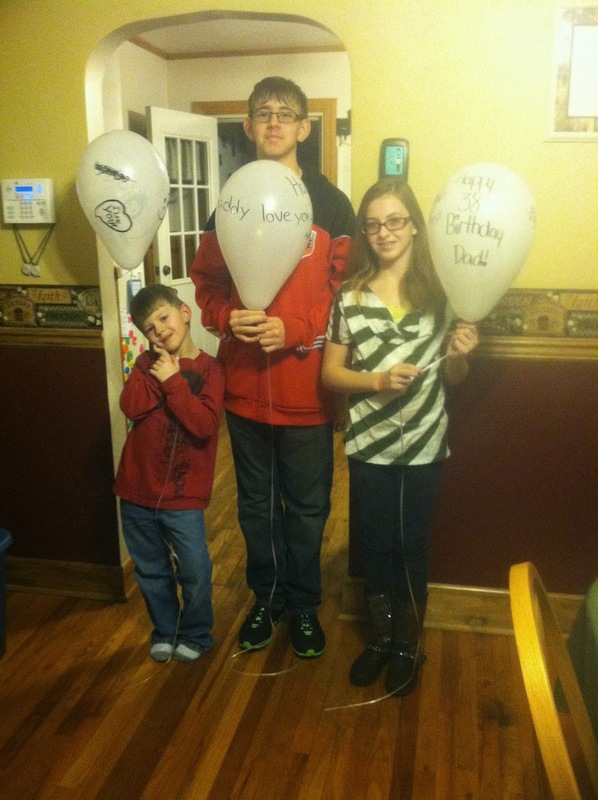 We did buy balloons, have the kids write messages to their dad on them, and then let them go at the house. John even wrote on a ballon for Mike. It was very sweet of him to show such support for us and what that day means. Mason laughed with surprise and delight when he saw John let the balloon go with ours. In the days that followed John and the kids watched Star Wars Episode I and II. I am beyond grateful that John is able to delve into the interests that the kids shared with their dad. Here's to another birthday without him.